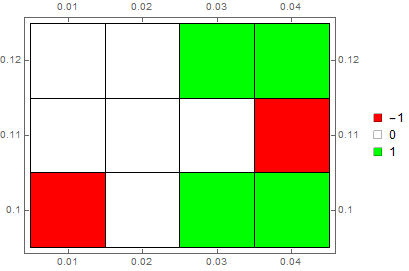 I have a matrix of values (potentially quite big), which I have decoded into values of -1, 0 and 1 based on some rules. I want to use the MatrixPlot to see the pattern. My issue is that the MatrixPlot automatically assigns the integer values corresponding to the position in the matrix in my case. 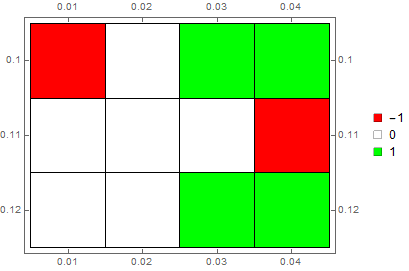 However, instead of the (integer) positions, I want to use my own grid (xrow and ycolumn) of the same size on the axes. I have tried to use FrameTicks, but clearly it is a wrong command as it pushed my x and y values to the corner. Not the answer you're looking for? Browse other questions tagged plotting labeling or ask your own question.